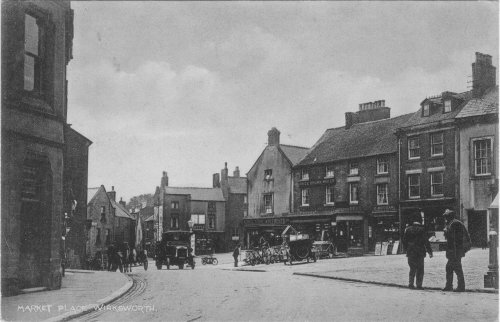 William W Marsden's famous hardware shop is in the centre, with implements for sale spread over the pavement, "Agricultural Implements", "Prize Churn Maker" and "Marsden" can be read. The business closed in 1982 after trading in Wirksworth since 1764. Right of this is a shop reading "D.Botham", which was a newsagents. Pity the billboards are just unreadable.